And the hardworking staff means that in the most positive sense. INDIAN WELLS, Calif. — Rafael Nadal‘s serve deserted him in the second set, and so did his chances of beating a streaking Novak Djokovic. Djokovic defeated the world’s top-ranked player 4-6, 6-3, 6-2 to win the BNP Paribas Open title on Sunday, keeping the Serbian perfect this year. 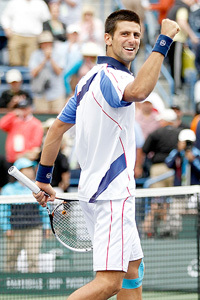 Djokovic improved to 18-0, including victories at the Australian Open and in Dubai last month. Good tennis? That’s like Eric Clapton saying he plays good guitar. Djokovic dictated the pace of the match, relentlessly attacked his opponent, and turned defense into offense on virtually every point. In other words, he Nadaled Nadal. This should be a very interesting year in professional tennis. This entry was posted in Uncategorized and tagged BNP Paribas, BNP Paribas Open, ESPN, Indian Wells, Nadaled Nadal, Novak Djokovic, Rafael Nadal. Bookmark the permalink.